Soup season is FINALLY upon us, and I couldn’t be more excited! Yes, this is coming from the gal who’s obsessed with muffins and cookies. And I’m bringing you one of my favorites. 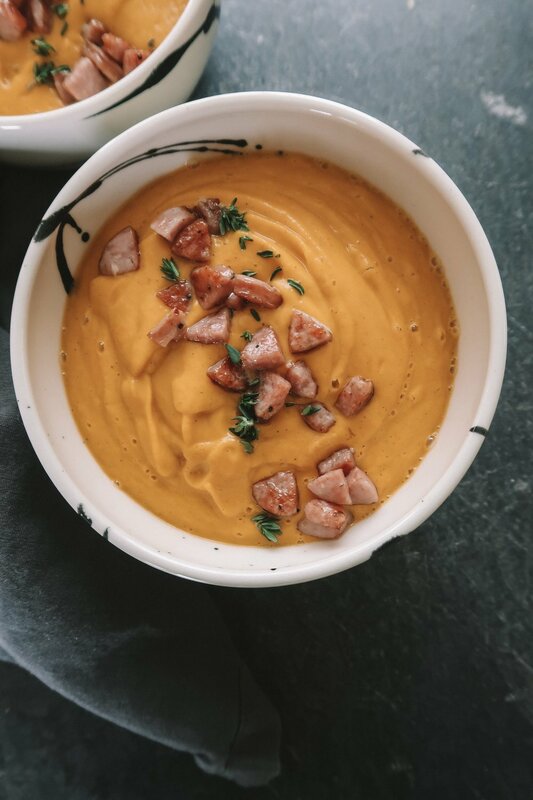 A creamy, hearty soup made with carrots, butternut squash, onions, potato, and some simple seasonings. The soup itself is paleo, Whole 30 compliant, and vegan. I added chopped sweet Italian chicken sausage from True Story Foods as a garnish on the top, and it really took this dish to the next level. But not to worry, if sausage isn’t your thing, you can omit all together, or add greens, pumpkin seeds, or even some quinoa. The possibilities are endless! Enjoy this recipe, and if you make it, don't forget to tag me @kalejunkie on Instagram and use hashtag #kalejunkie so I can see! Place all of the chopped vegetables on the baking sheet (potatoes, carrots, butternut squash, onion). Drizzle with avocado oil and sprinkle with salt and pepper. Roast vegetables in the oven for approximately 30 minutes. Meanwhile, chop two sausages into small pieces, and sauté them in a teaspoon of avocado oil in a pan on the stove. Remove from the heat once brown (approximately 3-5 minutes). Place roasted vegetables in your Vitamix or high speed blender, along with the chicken broth/bone broth, spices, and coconut milk. Pour soup into bowls and garnish with sausage and any other toppings you’d like!